Daniel Shea for The Wall Street Journal A worker at Mechanical Devices in Bloomington, Ill., where the company set up a training program to fill open machinist jobs. In Bloomington, Ill., machine shop Mechanical Devices can’t find the workers it needs to handle a sharp jump in business. Job fairs run by airline Emirates attract fewer applicants in the U.S. than in other countries. Truck-stop operator Pilot Flying J says job postings don’t elicit many more applicants than they did when the unemployment rate was below 5%. Mark Whitehouse discusses why, despite the tough economy, some companies are having a difficult time filling job openings. With a 9.5% jobless rate and some 15 million Americans looking for work, many employers are inundated with applicants. But a surprising number say they are getting an underwhelming response, and many are having trouble filling open positions. Employers and economists point to several explanations. Extending jobless benefits to 99 weeks gives the unemployed less incentive to search out new work. Millions of homeowners are unable to move for a job because the real-estate collapse leaves them owing more on their homes than they are worth. The job market itself also has changed. During the crisis, companies slashed millions of middle-skill, middle-wage jobs. That has created a glut of people who can’t qualify for highly skilled jobs but have a hard time adjusting to low-pay, unskilled work like the food servers that Pilot Flying J seeks for its truck stops. Daniel Shea for The Wall Street Journal Former truck driver Troy Arnett, 42, dropped out of a machinist training program at Mechanical Devices in Bloomington, Ill. The factory work, he says, was too restricting after years spent on the open road. The difficulty finding workers limits the economy’s ability to grow. It is particularly troubling at a time when 4.3% of the labor force has been out of work for more than six months—a level much higher than after any other recession since 1948. Nearly 1 in 10 Americans is unemployed, and 4.4 million of them have been out of a job at least a year and say they’re still looking for work. Many more have given up. Here’s a look at some of the people in this boat. Although some employers report trouble finding workers, about 4.4 million Americans have been looking for jobs for at least a year—and that doesn’t include the ones who have given up. Read some of their stories. Matching people with available jobs is always difficult after a recession as the economy remakes itself. But Labor Department data suggest the disconnect is particularly acute this time around. Since the economy bottomed out in mid-2009, the number of job openings has risen more than twice as fast as actual hires, a gap that didn’t appear until much later in the last recovery. The disparity is most notable in manufacturing, which has had among the biggest increases in openings. But it is also appearing in other areas, such as business services, education and health care. If the job market were working normally—that is, if openings were getting filled as they usually do—the U.S. should have about five million more gainfully employed people than it does, estimates David Altig, research director at the Federal Reserve Bank of Atlanta. That would correspond to an unemployment rate of 6.8%, instead of 9.5%. Of course, many jobs remain easy to fill. 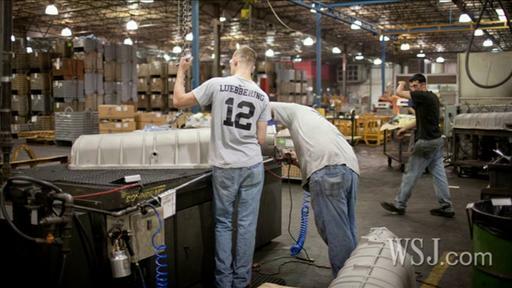 Companies offering middle-skilled jobs can be flooded with applicants. Laquita Stribling, a senior area vice president in Nashville for staffing firm Randstad, says she received several hundred applications for a branch manager job that might have attracted a few dozen candidates before the recession. “The talent pool has swollen to the point where it’s almost overwhelming,” says Ms. Stribling. But other employers with lots of applicants say the pool of qualified workers is small for specialized jobs. Carolyn Henn, head of hiring at environmental consultancy Apex Companies, says she recently received about 150 applications for an industrial hygienist job paying as much as $47,000 a year, which requires special certifications and expertise to oversee projects such as asbestos cleanups. That is about three times the amount she received for similar jobs before the recession. But she says the number of qualified applicants—about five—is less than she got before. Longer-term trends are at play. For one, the U.S. education system hasn’t been producing enough people with the highly specialized skills that many companies, particularly in manufacturing, require to keep driving productivity gains. “There are a lot of people who are unemployed, but those aren’t necessarily the people employers are looking for,” says David Autor, an economist at the Massachusetts Institute of Technology. Manufacturers of high-precision products such as automobile and aircraft parts are in a particularly tough spot. Global competition keeps them from raising wages much. But they need workers with the combination of math skills, intuition and stamina required to operate the computer-controlled metalworking machines that now dominate the factory floor. Some workers agree that unemployment benefits make them less likely to take whatever job comes along, particularly when those jobs don’t pay much. Michael Hatchell, a 52-year-old mechanic in Lumberton, N.C., says he turned down more than a dozen offers during the 59 weeks he was unemployed, because they didn’t pay more than the $450 a week he was collecting in benefits. One auto-parts store, he says, offered him $7.75 an hour, which amounts to only $310 a week for 40 hours. “I was not going to put myself in a situation where I was making that small of a wage,” says Mr. Hatchell. He has since found a better-paying job at a different auto-parts dealer. Unemployment benefits, though, can’t explain the whole problem. Researchers at the Federal Reserve have estimated that the benefits could account for between 0.4 and 1.7 percentage points of the unemployment rate. That doesn’t cover the 2.7-percentage-point gap between the current jobless rate and what Mr. Altig’s analysis of job openings suggests the rate should be. Some of the people who dropped out of the Mechanical Devices training program aren’t collecting unemployment benefits and offer other reasons why they couldn’t or wouldn’t do the work. Former truck driver Troy Arnett says the prospect of standing in front of a machine all day was just too restricting after a career spent making about $60,000 a year on the open road. “I figured in these economic times you’ve just got to bite the bullet, and I couldn’t do it,” says the 42-year-old Mr. Arnett. He considers himself among the lucky ones: He has since found a job installing railroad crossings that he expects will pay about $50,000 a year. Employers say getting people to move for work has been especially difficult this time. Often, that is a function of the mortgage and credit problems many potential employees face. In a recent study, Fernando Ferreira and Joseph Gyourko of the University of Pennsylvania, together with Joseph Tracy of the Federal Reserve Bank of New York, found that people who owe more on their mortgages than their homes are worth are about a third less mobile. At Emirates, four cabin-crew job fairs the airline held in Miami, Houston, San Francisco and Seattle attracted an average of about 50 people each, compared to a global average of about 150 and as many as 1,000 at some events in Europe and Asia. “I would have liked to have seen more and would have expected to see more,” says Rick Helliwell, vice president of recruitment. The jobs require little more than a high-school diploma and fluency in English. They include free accommodation and medical care, and starting pay of about $30,000 a year. Mr. Helliwell speculates that Americans might be hesitant to move to Dubai, where the jobs are based. “Maybe they have less of an adventurous spirit” given the uncertainties they face at home, he said. The obstacles to moving are aggravated because many employers no longer provide the same job security they have in the past. Temporary jobs, for example, have increased 21% since September 2009 as more employers—including Mechanical Devices—hire through staffing agencies to help control health-care costs and maintain flexibility. David Denton, a 63-year-old quality-control expert, recently quit a temporary job at Mechanical Devices. He says the terms of employment simply weren’t attractive enough to make him pick up stakes and move. The one-hour commute from his hometown of Mt. 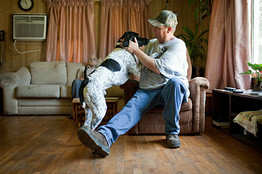 Zion, Ill., proved to be too burdensome, he says, as the cost of gasoline cut into his $15-an-hour wage. Like a number of older workers, Mr. Denton has decided to leave the work force rather than accept a lower-paying job. Mr. Denton says he plans to live on savings until he can collect full Social Security benefits at age 66. “I’m trying to hang on the best I can,” he says. 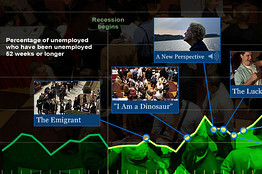 The disconnect between workers and jobs could constrain the economy for some time. It makes it hard for even small firms, which as a group typically account for an outsize share of job growth in a rebound.